Air Fryer Pepperoni and Peppers Stromboli cooks up perfectly in just 13 minutes. Wonderfully crunchy on the outside with lots of cheese, pepperoni, and peppers on the inside. Perfect for gameday, having guests over, or a family meal. I am completely in love with my Air Fryer. It cooks foods so fast and gets them fabulously golden and crispy on the outside. 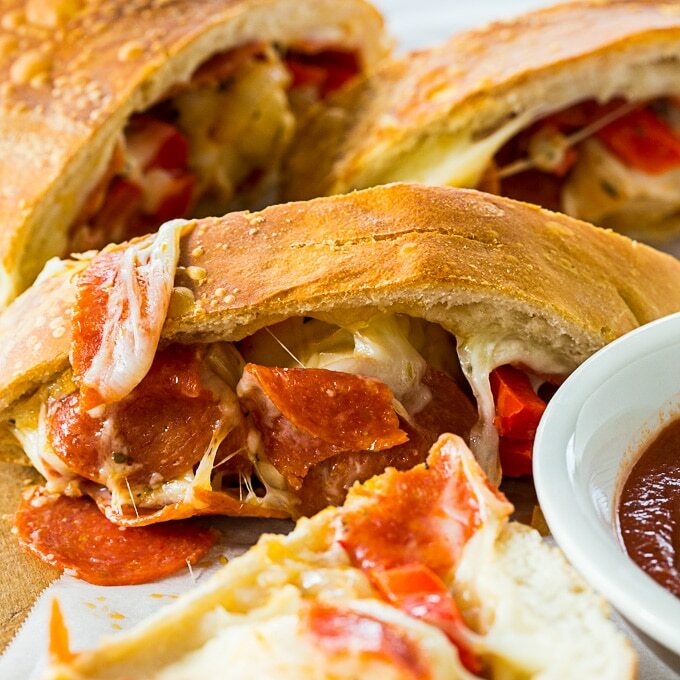 You won’t believe how delicous this Air Fryer Stromboli tastes! And there are endless variations you can make. What a great way to use up all the leftovers in your fridge and have a really economical meal. For this one I used mozzarella cheese, pepperoni, peppers and a few onions. I started with a premade fresh pizza dough which I get at Publix. You can usually find it in the deli section, but sometimes it is with the refrigerated biscuits. Sometimes they even have pre-rolled fresh dough. It comes in a circle but is really easy to stretch into a rectangle shape for stromboli. Pillsbury refrigerated pizza dough in a tube would also work. All a stromboli really is is a pizza rolled in a cylinder. I don’t put any pizza sauce on the dough. I just serve it with pizza sauce to dip it in. Give this Air Fryer Pepperoni and Peppers Stromboli recipe a try and you will have a homemade dinner that tastes like it came from your favorite pizza shop.